Thanks for being so awesome and continuing to support AYO! 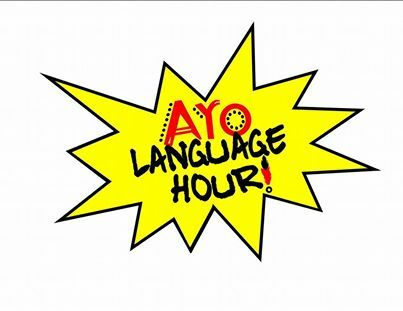 Language Hour. Special shout out to Agnes Catcheway (Anishinabe), and Sue Caribou (Cree) for their leadership and willingness to share the language. 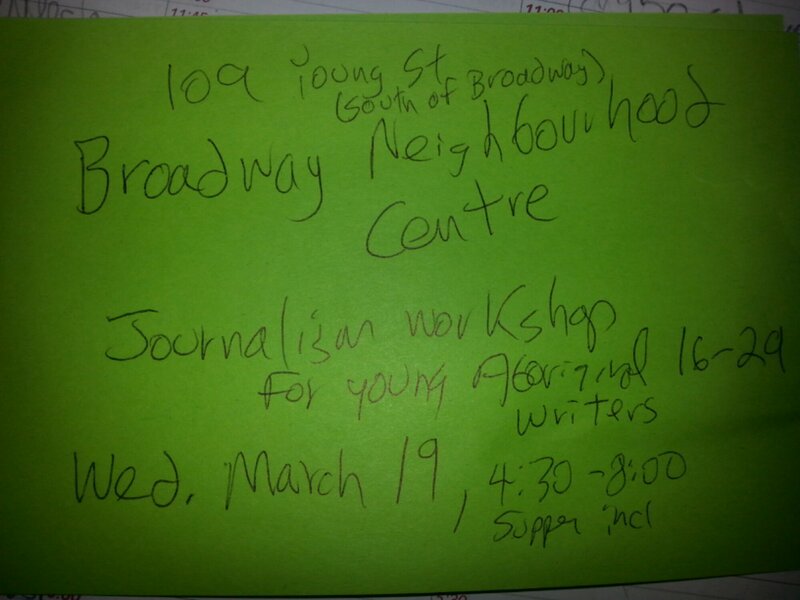 We welcome all individuals to come out to learn the language with us, with a special invitation to the neighbourhood’s young people. We would also like to thank Arlea and everyone at Neechi Niche and Neechi Commons for their continued support in sharing space for our learning! Please remember to bring a small offering of tobacco for our instructor (we would also like to pass around a hat , and each throw in a couple dollars for our instructor too). So this week’s theme was “Women in History”… as we tend to do at the Bell Tower, while chatting about our theme, we made a last minute change. One of our younger bell tower regulars said ‘its not HIS story, its HER story!” We thought that was a great idea, so that is why we called this post ‘Women in HERstory’ instead of the other one! After we finished our bell ringing, megaphoning, picture taking and rowdiness outside, we moved into the Family Centre for our Prizes and History Lessons (which was tons of fun, since we were all the teachers). Find below a list of the women honoured and celebrated at our Bell Tower event, celebrating the many contributions of women throughout the ages, and throughout the world. You are invited to join us next week as we explore traditional teachings of the FIRE, in an effort to encourage safety in the community, also an opportunity for young men and community members to learn about their responsibility as men (protectors of the fire). CLICK HERE TO GO TO THE Re-Igniting The Fire FB Event Page! 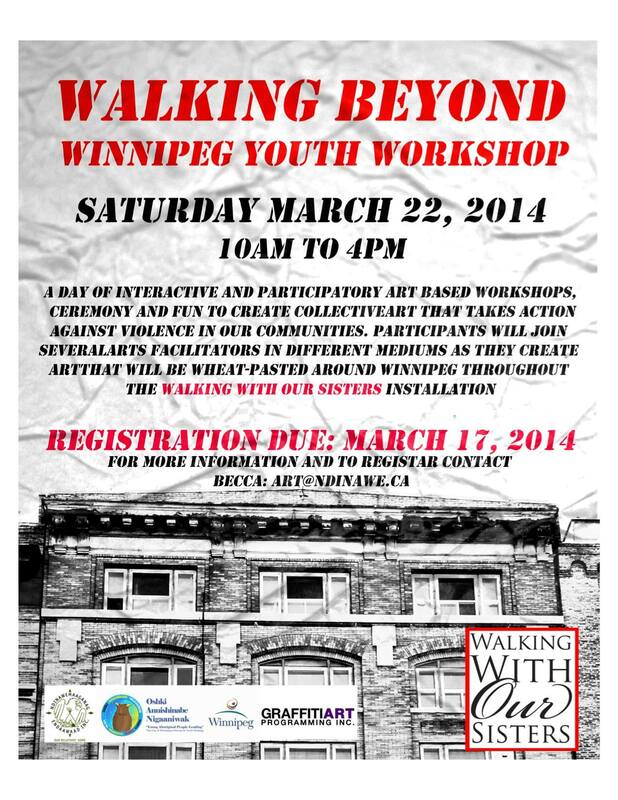 Thanks to Ko’ona, WCDanyting, Greg, Nona, Ramona, Shaunna, Toussaint for helping honour AYO! Leadership at the 2014 North End Volunteer Appreciation Dinner on March 25th 2014. Special shout out to the organizing committee and the entire North End Community Helpers Network for pulling off such a classy event – we feel honoured! 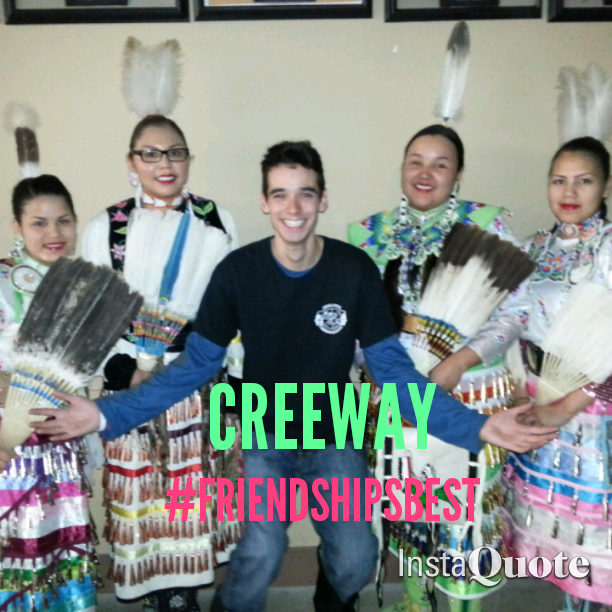 Congratulations to Evander & Creeway Sisters – You Are #FriendshipsBest ! 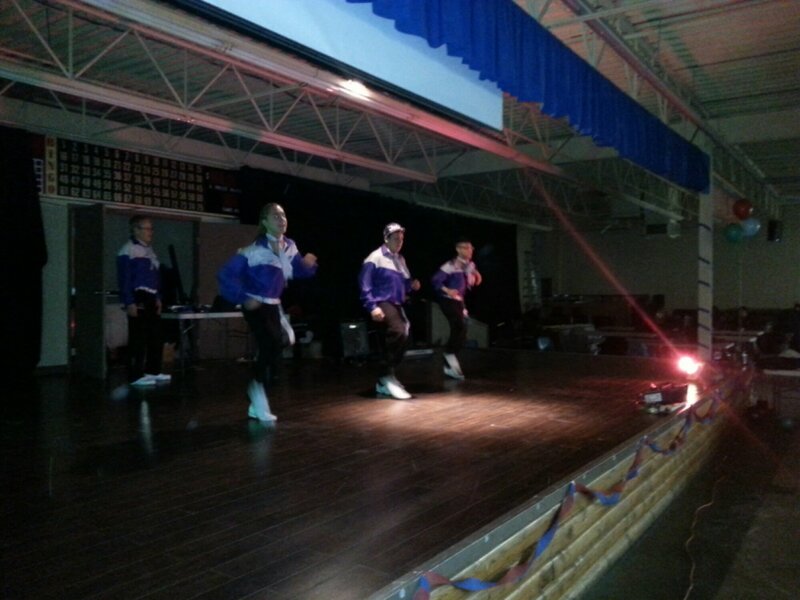 On Thursday March 20th, 2014 “Friendship’s Best Dance Crew” took place at the Indian & Metis Friendship Centre of Winnipeg (45 Robinson). The IMFC Youth Advisory Council worked hard over the last number of months in partnerships with the Cultural Connections for Aboriginal Youth Program, Aboriginal Youth Opportunities, Native Communications Incorporated & JustTV to name a few! We began with some dancing courtesy of DJ Jordan Omand, followed by some dancing games and spot dances for the children in attendance. It was fun for all. 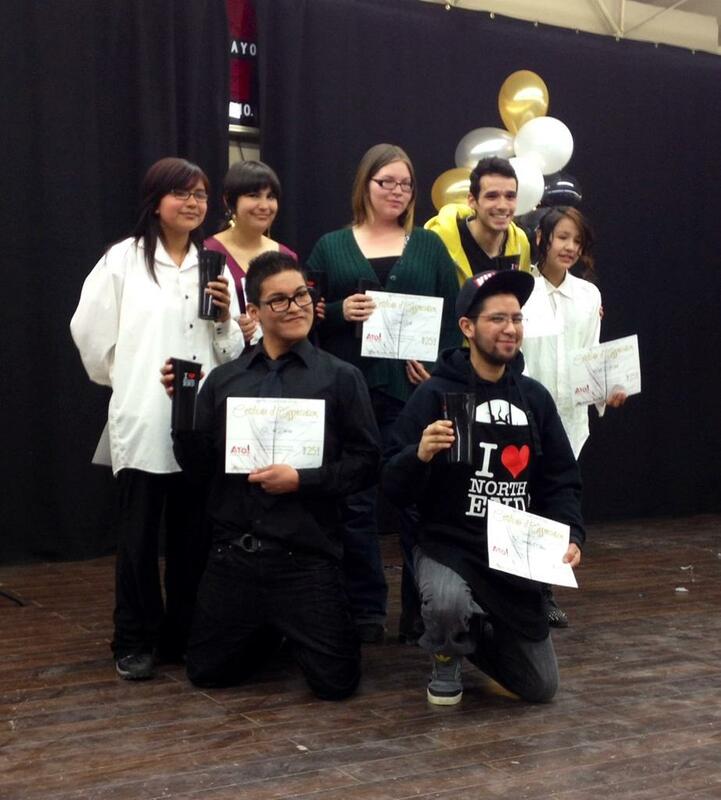 This was also when the people came in, including our guest judges Miss Meliss (NCI) and Erica Daniels (JustTV). We had several entries to dance, but in the end only one person in the single category, and one in the group category came out. This meant that we were able to crown both Evander Twoheart and the Creeway Sisters with the title of 2014 Friendship’s Best Dancers! Ladies first, we had the Creeway Sisters who explained to us their name was due to a combination of Cree and Ojibway dancers in the group(CREE + ojibWAY). These young ladies were great role models performing to a traditional pow wow song and wowing the audience with their coordinated and hip hop infused traditional demonstration. 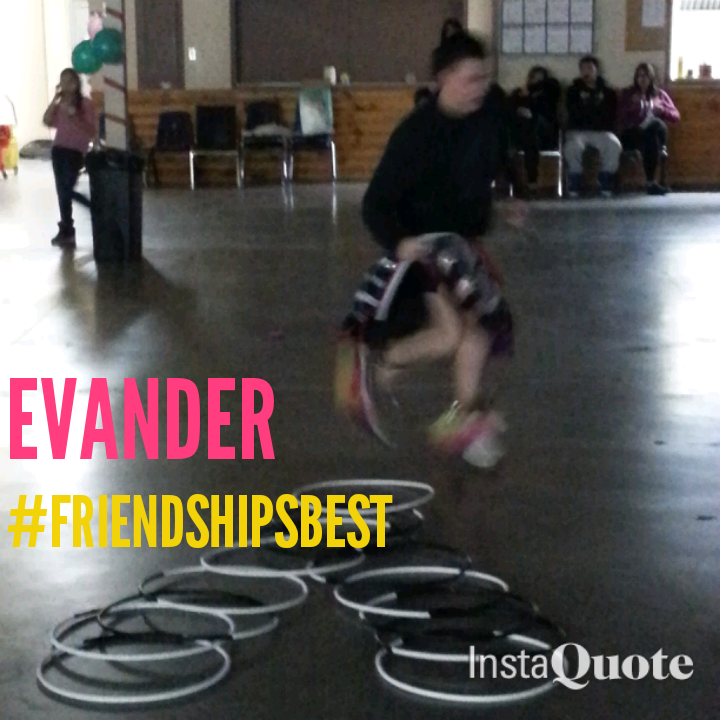 Next we saw Evander Twoheart, who has been dancing for over 10 years! He began the evening performing a hoop dance for over 7 minutes and finished our evening with an encore performance in Men’s Traditional gear. These young people have earned and demonstrated the true reason why we will be calling them “Friendships Best” For the next year!! 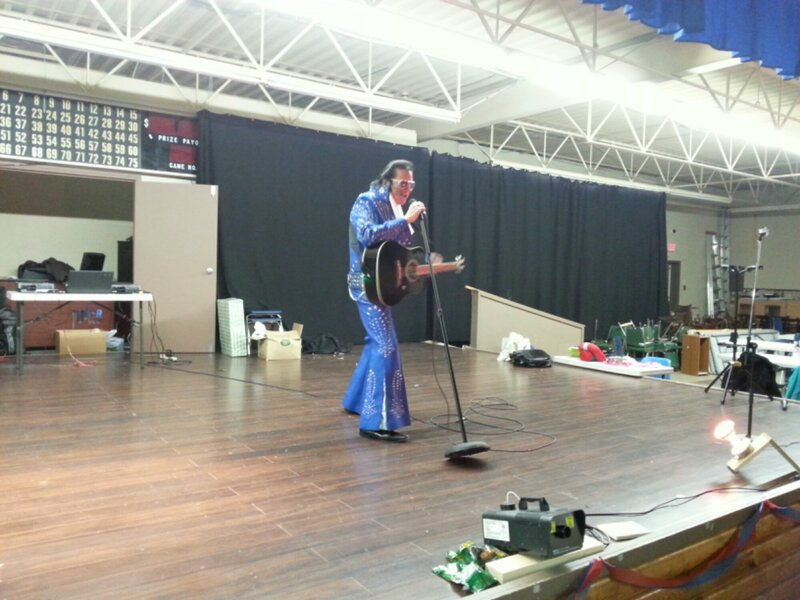 We were fortunate to have special performers in the house including the infamous Ojibway Elvis! He got us all shook up with 30 minutes of glittering excitement – dazzling us with his spot on Elvis impersonation dedicated to the elders. 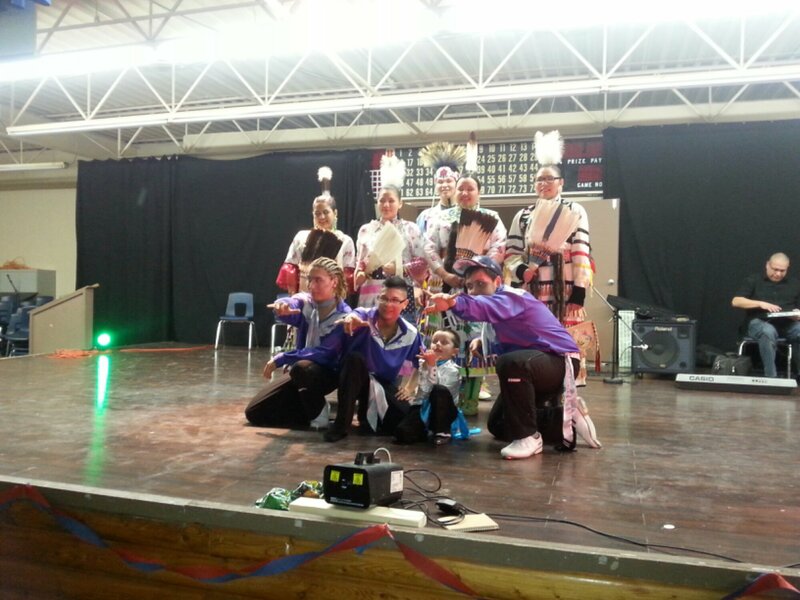 Next we had our finale for the evening Sagkeeng’s Finest – who performed with a 6 year old dancer. They even had 2 younger men in attendance, not in uniform who went on stage bare foot and judged as well. All in all the special guests were fantastic! The winners will be awarded a variety of prizes and will now have special guest spot at the Indian and Metis Friendship Centre’s Aboriginal Day Pow Wow as well as performing onstage at the Vision Quest Conference!! Stay tuned for more announcements on what these amazing young people are up to as well as in depth interviews with each of the groups! Special shout out to all the kids who danced and especially to these fine young people for their awesome dance moves and their positive example! I remember when you were just an empty lot…but now you have become so much to so many. A place of peace for those besieged because of who they are, a place of learning for young people when they want to connect. You have been invaluable to my own spiritual learning, the ceremonies, the responsibilities and the opportunities to welcome travelers, receive and send them off in a good way. 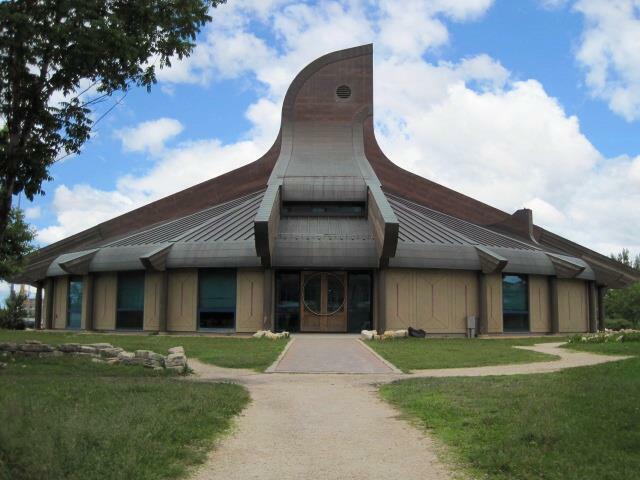 Thunderbird, you have been the guide for the young people of our community for so many years before we even knew you. And then you rose from the empty lot, in the middle of the exploitation and the guilt based charity. Strong, proud and like nothing we had ever seen. Traditional, warm, a reminder that Indigenous doesn’t mean drunk – a physical reminder of the beauty that lay inside of each of us. You welcomed the young people in when we had no money, only ideas. You helped Aboriginal Youth Opportunities begin on that cold Spring day , four years ago – March 17th, 2010. And look at that has happened since then….you have hosted drum gatherings, welcomed water walker’s, hosted birthday parties and celebrations for us young people. All this time, we couldn’t pay you. Not in dollars anyway, because we didn’t have many of those for ourselves. Many of us were homeless as we did this work – until we got to Thunderbird House. But instead, we worked. We learned the teachings you provided space for us to learn about, and we applied them. We did dishes, we swept floors, we helped elders – we were the helpers you showed us we were. That ethic applied to our work, and to our relationships with our friend, families and neighbours on the street brings us closer together. We have tried to be the good ancestors, thinking seven generations ahead in our actions, and trying to give away our gifts as best we can in our community – asking for compensation only when it is possible from those we serve. We feel your pain – and are scared of what might happen if the Thunderbird House closed its doors? The very thought is terrifying. The next generation of AYO Leaders wouldn’t have a safe place to cry, heal and learn. They wouldn’t have a safe place to let their spirits soar for the first time, being brave enough to pick up a drumstick or begin to learn their own native language. Thunderbird House our young people need you, and we will begin to work in whatever ways you tell us we should, to help you stay open, and stand strong for our children, and theirs too. We love you for what you have done and what you continue to do. 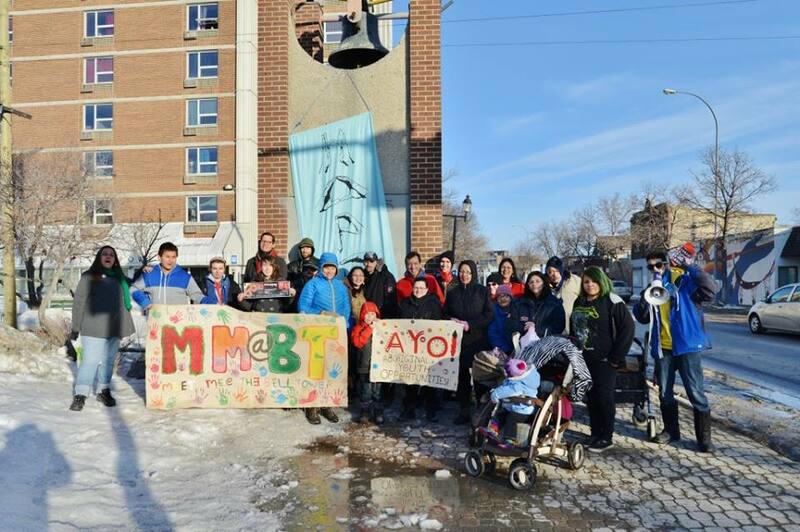 Aboriginal Youth Opportunities stands with Circle of Life Thunderbird House & will raise awareness about their need for support in and around Winnipeg and Turtle Island. We don’t know how we are going to help you yet, but we know we have to start with love. The theft that happens at Thunderbird House is regrettable. We have seen many items disappear. Both from the TBH itself, and from our numerous visitors. That is the nature of our home. It is open for everyone. Unfortunately, not everyone is thankful for the house. Unfortunately for some it is an opportunity to steal. We have no money to keep the doors open. We have no money to keep people from stealing. But we have to keep the doors open. That is why the volunteers, the renters are important to the house. So the doors can be open to everyone. We hope that the City of Winnipeg, may decide to put us on their list of Community Centres and provide us with operating funds. We hope that more of the community sees the opportunities and benefit of TBH and decide to rent space. We say thank you for your patience. We say thank you for your support. We hope that the turn of events has not soured you to the good that can happen at Thunderbird House. We can only pray that the people who steal eyes open to what they are doing. Shout out to Mike for passing this sticky note to MC. See u out Wednesday!